Want to Swim 200 Fly at any age? Balance & Streamline. Since I posted How Would Einstein Teach Swimming, I find myself reminded almost daily of the clarifying simplicity of Balance-Streamline-Propel as a values system. I’ll devote several blogs to examples. Yesterday someone posted this query on the Butterfly conference of the TI Discussion Forum. I currently use the Butterfly/Breaststroke DVD from the TYI 4 Strokes Made Easy set. Can anyone please tell me what’s different about the more recent Better Fly for Every Body DVD? I answered that with the earlier learning process young swimmers had seemed to adapt easily, but not adults. 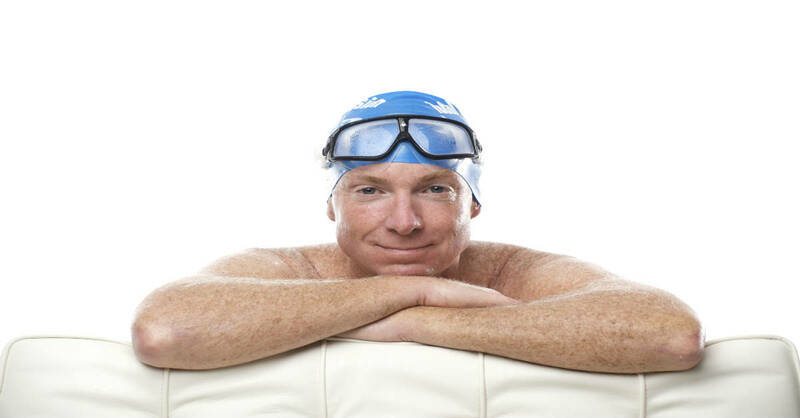 My personal experience was similar: The older drills helped me translate a Breaststroke feeling — which had always been easier– into Fly. Yet I still couldn’t swim more than 50 Fly before wearing down. I began seeking a new teaching method for both strokes, because the Body Dolphins — the heart of the earlier sequence – never felt quite natural, at least for me, in the two strokes. At first I thought the problem was with my inflexible lower back rather than the drill. But in observing others I felt the dolphins were leaving a stronger imprint than actions to extend and streamline. In 2005 I began using the Endless Pool in our Swim Studio to experiment with drills that emphasized Streamlining. Land Forward and Cooperate with Gravity. This is a Balance Thought. Rather than dive in, strive to maximize forward momentum on landing, while letting gravity put you back under water. Hold Streamline while letting Buoyancy Work. This is a Balance Thought merged with a Streamlining Thought. Mindfully hold extension for an extra nanosecond – so you continue traveling forward as gravity draws you down and as buoyancy becomes the stronger force and begins to return you to the surface. Help with Hands – gently and briefly – as head emerges. This is an Effortless Propulsion Thought. Pushing water back with a conventional ‘Fly pull’ tires the arms and often causes the arms to get ‘stuck’ at the hips, making the recovery labored. Using the hands instead to hold place, then ‘help’ the head as it emerges effortlessly with the help of buoyancy, causes the arms to ‘fly’ easily, lightly, around and forward again to the front. Once I had the BetterFly sequence in its final form, within a few weeks I went from feeling like toast after 50 yards – a limitation that had frustrated me for 40 years — to holding a steady pace for 200 yards at age 55. I credit this to two things: (1) The rhythm and timing that arise from ‘playing’ with Gravity and Buoyancy feel far more natural than the imposed rhythms of Body Dolphin; and (2) Directing ‘available’ forces rather than generating muscular forces is far less fatiguing. The key departure of BetterFly from earlier ways to teach Fly – and TI remains the only method to emphasize this – is: 1) Master Balance; 2) Streamline; 3) Propel Effortlessly. Study all three in the underwater sequences from :30 to :52 seconds in this video clip. In particular note how long the ‘restful’ phase in each stroke is compared to the ‘working’ phase. Even while doing nothing, I continue to travel forward at a good clip during my streamlined glide. Balance allows me to minimize the need to kick. Streamlining conserves momentum as I do. The ease allowed me to swim 200 Fly without tiring. Maintaining momentum allowed me to win the gold in my age group in all three Masters meets in which I entered the event. Thank for this blog entry, Terry. It’s really helpful to understand the fly better. Regarding this video, that kick is how your butterfly will look in the end or is just an intermediate drill? I’m just wondering because it doesn’t like how Phelps or any other fly-swimmers do it. It seems more like a combination of breaststroke with fly stroke. Maybe I’m a purist but it certainly doesn’t look like a butterfly. Can you complete with that kind of kick? That’s called ButterFrog. It’s how I swim Fly 90 percent of the time. It’s legal for Masters swimmers all over the world. I believe it’s also legal for HS swimming in the US. It’s not approved by FINA for more mainstream competitive swimming. Apart from competitive swimming, I feel ButterFrog is ideal for fitness swimmers who’d like to add Butterfly swimming to their ‘bucket list’ and know the sense of accomplishment from being able to swim it for extended distances. As the video makes clear it’s far more relaxing, and sustainable, than the kind of Fly that Phelps and other fit young athletes swim. All up and down movements of the legs must be simultaneous. The legs or the feet need not be on the same level, but they shall not alternate. A breaststroke kick is not permitted. In my experience also easier for people who don’t think of themselves as ‘older’ – as has been the case for my since the first time I tried Butterfrog at 55.